ebook and print editions. It’s always a pleasure to return to Veloris, the Ice Planet, but this journey took years, many revisions, and labor before Devourer came to life. So, help me celebrate her birth. She’s already received 5 Star Reviews over at Amazon, so I think Akub is off to a great start. Instead of a birth announcement, I’m going to give you a brief excerpt from the novel. “You’re the Devourer.” The queen nodded at Akub. “Yes.” Akub crossed her arms and readied herself for the onslaught of questions. “I killed no one.” Akub’s tone was sharp. Akub couldn’t deny those words. Some truths settled in uncomfortable pain in her memory and in her heart. No matter how much good she did, the sticky and oily stain covered her . Her spirit would never be unblemished. Octiva’s words about forgiveness echoed in her mind. Her actions had less to do with pleasing others than proving to herself that she could do righteous and good acts. When everywhere she went, her past as the Devourer preceded, and few gave her opportunities to be anything else, other than what they wanted—their bogeyman, their horror. Akub would be those things no more. She threw off her tapestry of shame. “Those deeds lie in my past, your highness. For many years, I’ve traveled and devoted my life to spreading goodwill.” Even to her own ears, it sounded as if Akub meant to justify her actions—as if anything she did could. Get a copy of Devourer: A Minister Knight Novel exclusively at Amazon. This past weekend I had the pleasure of traveling up I-85, heading north to Richmond, Virginia. I was going to Ravencon, a science fiction convention held at the Double Tree Hotel. The convention celebrates fandoms in science fiction, fantasy,and horror. While this is my first time to Richmond for Ravencon, but not my first science fiction convention. I’ve been a guest and panelist at sf conventions from Seattle to Charleston since 2005. This year was their 10th anniversary and their last in Richmond. Next year, the convention will be held in Williamsburg, VA.
One of the exciting things about going to conventions is meeting people who love the same genres as you. I had the opportunity to sign copies of both SILENCED and THE SOUL CAGES during my one hour author signing in the dealer’s room. While there I had the chance to talk to Warren Lapine, the editor of Fantastic Stories of the Imagination. If you aren’t supporting their indiegogo campaign, I strongly suggest you do. They’re inclusive, fresh, and responsive. That has as much to do with Warren’s direction and vision than anything else. One of the joys of being in the dealer’s room was meeting Danielle Ackley-Mcphail, a fellow member of Broad Universe, a lover of Weird Westerns, and the publisher of eSpec. I also met Pamela Kinney–again. I had met her briefly at Mysticon two years ago. 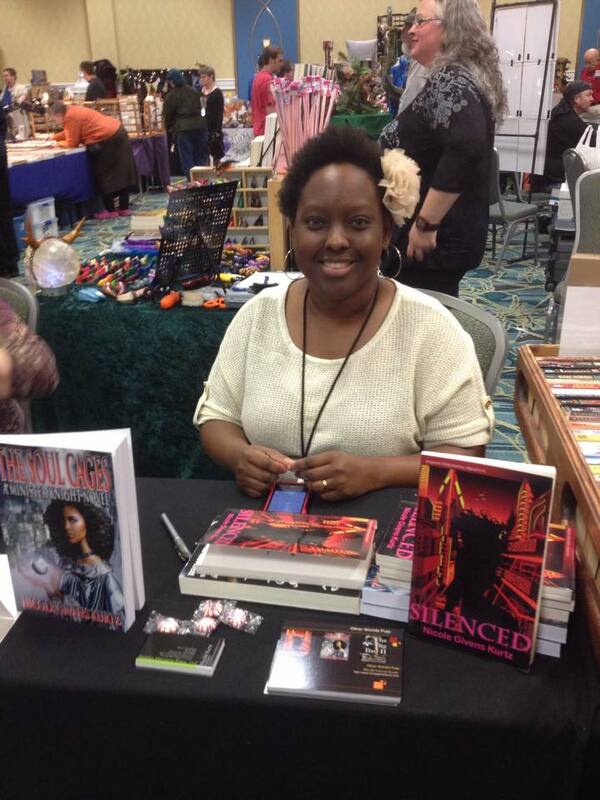 She’s a paranormal writer, romance author, and horror author as well. I mentioned that Danielle and I are members of Broad Universe. I’ve done readings before, but this one was truly “rapid fire.” Seven female authors, including Gail Martin, KT Pinto, and Leona Wisoker, received radio worthy introductions by Jean Marie Ward, and 5-6 minutes to read an excerpt of our works. It went by fast! I truly enjoyed listening to the various stories and each authors’ unique voice. This was a sampler of how great “broads” in speculative fiction had to offer. For those who look at women and dismiss our abilities as talented, thought provoking, entertaining, witty, wicked, and brilliant authors, I dare you to attend one of the Broad Universe’s Rapid Fire readings. I had four panels at Ravencon, and all were well attended.Additionally, I moderated two of them, and received kudos for how I moderated. Sometimes I felt my teacher training kicking in during some sessions, but by far the most lively of those events resided in the Weird Western (with Doc Coleman, RS Belcher, Danielle Ackley-Mcphail, Jean Marie Ward) and the Ancient Aliens (see left) panels. I had a great time of discussing the all the topics, but the most friendliness was the horror panel at 11pm Saturday night with Travis I. Sivart and Pamela Kinney. Despite the fun I had on the panels, I would’ve loved to see more opportunities for a diverse populous. 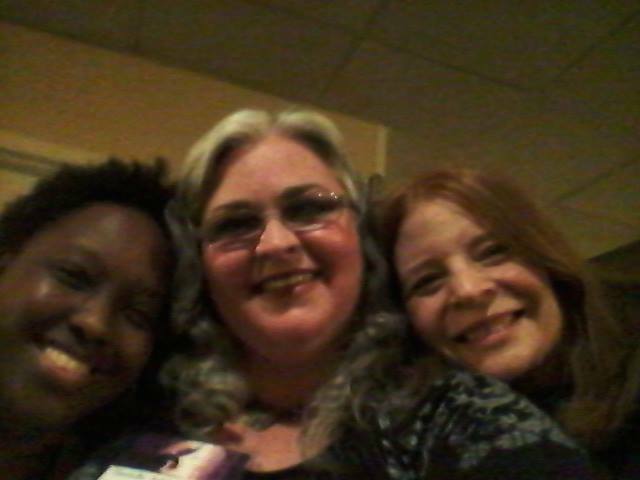 I moderated a panel on positive female protagonists in science fiction, fantasy, and horror. The artist guest of honor was Frank Wu, world renowned artist, but as far as panel discussions go, there were very few topics concerning inclusiveness in publishing, diverse people in publishing, or the like. I didn’t get to any of Warren Lapine’s panels due to conflict in schedules, so he may have addressed those topics on his panels. I do applaud Congregate’s forward approach to actively incorporating people of color in their programming and being unafraid to hold honest discussion and panels on marginalized people in speculative fiction. I would’ve loved to see more of this approach in other science fiction conventions across the southeast. Enjoy elves? Magic? Sorcerers? Swords? 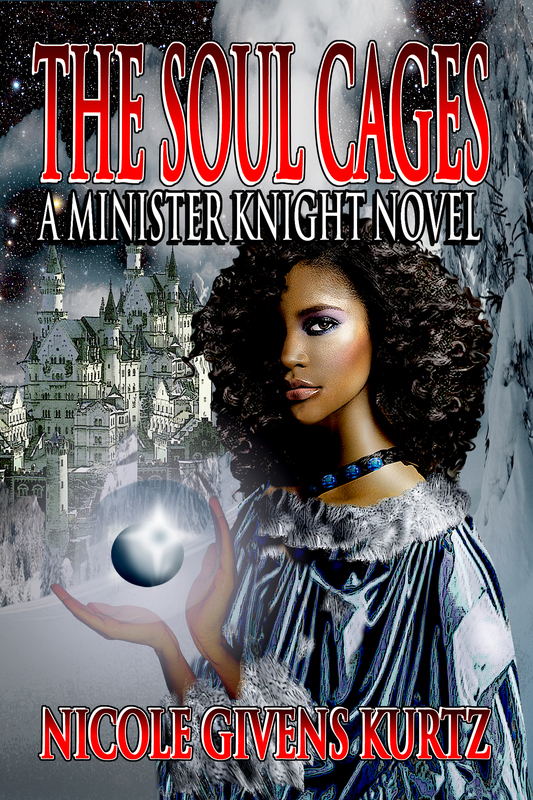 Allow me to introduce my series, The Soul Cages: A Minister Knight Novel. The series’ first installment is The Soul Cages: A Minister Knight Novel. The second short story, Marshall, the Minister of Souls, is set to be published by Mocha Memoirs Press in May. The other stories in the series have been written and will be published bi-monthly over the next three months. Blurb: For Sarah, imprisonment in Solis’s soul cages meant an absence of senses. Unable to feel, to taste, to smell, or to love, Sarah’s driven by her desire to escape and to become flesh once more. When she’s rescued by the legendary ministers of souls, Sarah’s elation is short lived. The legendary knights, led by prince Marion of Veloris, are splintered and prone to in-fighting and jealousy. With Valek’s power growing, Sarah and Marion embark on a dangerous quest to stop Valek, his plans, and the massive abduction of thousands of souls. Sarah must find her inner strength and search her own soul to uncover courage to face her former tormentor–and to embrace love, something she never saw coming. With betrayal, action, magic, and love, The Soul Cages, is one fast ride. Are you interested in reviewing this title? Shoot me an email. Want a discount on this title? Follow me on Twitter and send me a tweet–and I’ll send you a discount code for the print copy of The Soul Cages.